The Chinese mid autumn festival is this weekend and moon cakes which are normally eaten during this festive occasion are easily available one month prior to this fun event. Grrr! My local favorite moon cake now cost me $10. Each! Singapore is the most expensive city in the world to live (2015 EIU reports) and my mooncake price clearly reflects this unenviable expensive title. Picture shows a green tea filling cake. Mooncakes are traditionally filled with sweetened lotus seed paste but now everywhere you go in Singapore, there are durian, chocolate mousse, ice cream and tea flavored cakes for sale. Earl grey, matcha, milk tea and green tea are examples of tea flavored cakes. A recent local newspaper article (The New Paper, 13 Sept 2015 - Is the price right? by Khairiyah Amirah Md Ramthan) highlighted the price of gold yin zhen tea (silver needle) selling at $850 per 50g (about US$600). The reporter made a mistake when he priced a cup of tea at $178.50 based on 2.5g of tea. It should be $42.50 a cup. The article explained that the silver needle tea leaves are plated with 24k gold. Available at TWG Tea. It is really pricey, especially to me, that a cup of tea costs above $40. I would like to ask my readers a question - How much does it cost for you to have a tea session? Specifically, how much is your tea per tea session? This is a fun exercise. I just want to show that prices of tea had risen over the past few years. Examining price of tea per tea session, is to me, an interesting measure of the cost of tea to a tea drinker. Do remember to allocate the freight costs to your tea if you are buying online. It would give an even more accurate figure. If a pu erh tea cake weighs 357g and costs $50, you should be able to have about 50 tea sessions if you used 7g of tea in a brew. That will cost you about $1 per brewing session. Likewise, for a oolong tea drinker, if you are using 5g of oolong per brew, your $50 100g oolong pack would imply $2.5 per tea session. That good tea need not necessarily be expensive. If you drink lots of Chinese tea like me, you can easily have a happy tea session costing less than $2. At $2 or higher per tea session, I would like to think that the tea drinker is buying a particular vintage, a taste or aroma, or to fill /complete a tea collection. I bought these 2 small tea trays last month. These tea trays are really small. These trays come with removable lids where you can easily discard the tea waste and clean these trays without any difficulty. I could just manage to squeeze a small teapot and 2 tiny teacups on one tray. For those who like to brew their tea in a 'standing room' style or where real estate is scarce, and there is no room or table space to brew your tea, these tea trays would be most suitable (ideal even) for your tea brewing sessions. While I was taking pictures of these tea trays, it crossed my mind that these tea trays could have been cricket boxes. Keeping crickets was a hobby in China and crickets were kept as pets and taken out for 'gladiatorial battles' with other crickets. I have seen porcelain cricket containers that were somewhat shaped like these small tea trays (early 90s), but my checks with my China tea drinker friends indicated that these yixing trays were for brewing tea. 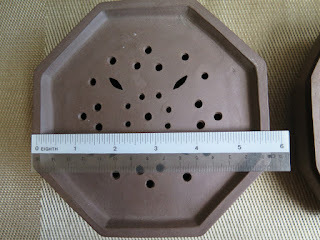 These trays were made in the 80s or 90s and keeping of crickets was not an activity practiced during the stricter government controls of that period. I would recommend using these small tea trays just to stand your teapot during tea brewing sessions. I personally would use bigger tea trays for my tea brewing session. Bigger trays are more practical for me, and the bigger space is visually more appealing, more calming when I sit down for my cup of tea. LONDON -- You would be hard-pressed to come up with a beverage more British than tea. Well, okay, possibly a pint of beer. But still, a hot cuppa tea is a quintessential British thirst-quencher. So it came as a bit of shock this week when Mintel, a consumer research company, reported that tea sales in the U.K. had fallen 22 percent between 2010 and 2015, to 76 million kilograms. What’s more, it said, the trend is continuing, and predicted that tea sales would dip to 68 million kilograms by 2020. A big problem for British tea companies is that 86 percent of tea in the U.K. is consumed at home, almost all of it made with tea bags. And between 2012 and 2014, Mintel says, tea bag sales sank by 13 percent to a value of £425 million ($660 million). “Standard black tea is struggling to maintain consumers’ interest amid growing competition from other drinks -- held back by a rather uninspiring image,” Emma Clifford, the report’s author, says in a statement. And demography is a factor, too. Younger consumers, she says, are less loyal to tea than their elders. Britain’s love of tea began brewing in the 1660s, when a Portuguese princess, Catherine of Braganza, became the wife and queen of Charles II. She had grown up drinking the stuff, and her love of tea eventually made it the fashionable hot drink of choice among the aristocracy. And its popularity quickly spread to the hoi polloi. The East India Company, which had a monopoly on trade with the Far East, placed the first order for tea -- 100 pounds of it -- in 1664. By 1685, annual tea imports totaled more than 12,000 pounds, and by 1750, yearly imports hit 4.7 million pounds. By then, the association notes, tea had become more popular than ale and gin with the masses. Essentially, as Britain built its empire, the effort was well-oiled with countless cups of tea. The drink also played a pivotal role in the American Revolution. It was Parliament giving the East India Company monopoly rights on exporting tea -- and taxing it -- to the American colonies that lead to the Boston Tea Party in 1773. That’s when anti-British patriots, dressed like Native Americans, boarded three British merchant ships and dumped 46 tons of tea into Boston Harbor. The protest proved to be one of the seminal events leading to the War of Independence, even though it had more to do with protecting the interests of American tea importers than with protesting British taxes. So does the Mintel report signal the eventual end of yet one more British tradition at a time when pubs are closing at a rate of 31 a week and red phone boxes are disappearing from roadsides? Perhaps not, because the British have hardly lost their taste for tea -- they’re just drinking less of traditional black tea. Mintel points out that 54 percent of Britons still drink at least one cup a day, and three-quarters drink one to three cups a month. Meanwhile sales of specialty teas, including herbal and fruit teas, are booming. Between 2012 and 2014, Mintel says, sales of those teas jumped 31 percent to a market value of £76 million ($118 million). One thing the British are not doing is replacing tea with coffee. They still drink around 165 million cups of tea daily, compared to just 70 million cups of coffee. A report last year by investment bank Barclays found that coffee consumption in the U.K. is lower now than it was in 2006. And not all tea companies are feeling the squeeze. Twinings -- which has 19 percent of the U.K. market, second only to PG Tips’ 25 percent market share -- has experienced strong growth, Clifford says. It’s benefited from anticipating a recent surge of interest in loose, specialty teas, and has brought out a wider range of non-traditional teas than its rivals. One thing that is missing from the High Street landscape in Britain is a successful chain of tea houses -- mainly because it’s still a drink that most folks prefer to make for themselves. And that’s where coffee purveyors have an edge. If coffee consumption has plateaued in Britain, the market for coffee houses is nevertheless hotter than a steaming mug of joe -- it’s expanding at a rate of 5 percent a year. Costa, the leading U.K. coffee chain with more than 1,800 outlets across the country, last month announced it was spending £36 million ($56 million) on a new roastery to help meet growing demand. And Gorman thinks that it will be the coffee houses that will help expand the market for tea outside the home. As the coffee house market grows, he says, the big chains are expanding their offerings, and are increasingly adding teas to their menus. That is bringing British tea-drinking full circle, given that tea was originally consumed in the 17th century mainly in coffee houses. And, Gorman says, afternoon teas at posh hotels like the Ritz and Claridge’s -- with pots of tea served with a huge variety of cakes, cookies and scones slathered with strawberry jam and clotted cream -- are more popular than ever. So Americans heading for England this summer needn’t worry they’ll have a hard time finding someplace to enjoy a traditional cuppa -- just as long as they don’t expect to order iced tea. “That’s never caught on,” Gorman says. “Tea is a hot drink here.” Just not quite as hot as it used to be.